When educators and industry experts venture in the online learning world, it is crucial for them to be very detailed in planning and designing their course. Without face to face interaction with their students, they will be relying solely on the materials on the course site. So to avoid confusion or unnecessary email queries, the course should be straightforward, structured, and easily understood by different learners with different levels of skill and experiences. After you’ve completed designing and creating an online course, the next step is to let your target market know about how great your course is and how they will benefit from it. Here are five marketing tips that will help you successfully promote your online course and optimize your potential target niche. For you to effectively market your online course, you will have to determine who would be interested in the type of training that you are offering. This process will entail some market research, interviews, surveys, and focus group discussions so you can learn all you need to know about the different education and cultural backgrounds of your potential learners. Online courses are taken by individuals and organizations to answer their need to achieve particular goals, may it be for personal or professional growth. This is where marketing efforts come in. Let them know how taking your online course could help them learn the skills they need and the various benefits that learning this new skill will bring them in their work or their personal affairs. You’ll have to give your target audience a reason to invest time and money into your online course. Let them know how investing money into your course would benefit them after completing it. Time is also a valuable commodity, so put emphasis on how much they can achieve by devoting a relatively short amount of time for completing the course. Prepare a short video introducing yourself and the course to your target audience. In the video, highlight your credentials and outline the ways you will be sharing your skills and expertise to your students through the online course that you created. Enumerate the advantages of taking the course, then invite them to visit your course website to learn more about it. Also include your contact details towards the end of the video. There’s no better way to convince potential students to sign up for your online course than to show them how other people like themselves have benefited from taking your course. Ask actual learners who have successfully completed your course to write an online review or share their testimonial and post these on your website. Once an interested individual sees how your course has positively affected another person, this will give them a very good reason to finally enroll for your online course. 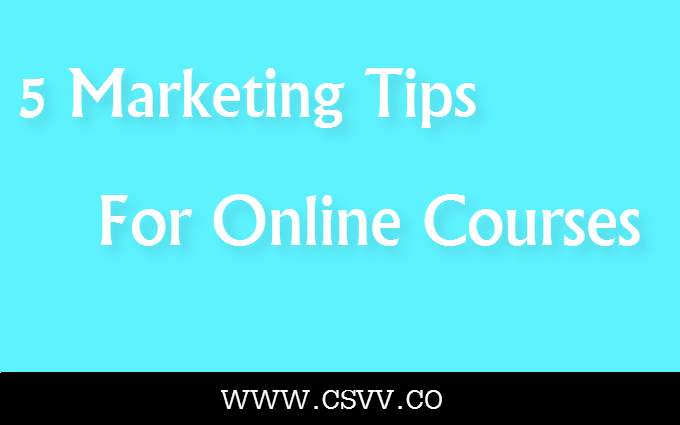 With these marketing tips, you will be able to reach your target audience and let them know that there is an online course available for them that will immensely help them in achieving their personal or professional goals. Michelle Rubio has been writing for SMEs across the United States, Canada, Australia and the UK for the last five years. She is a highly-experienced blogger and SEO copywriter, writing business blogs for various industries such as marketing, law, health and wellness, beauty, and education, particularly on creating online courses such as those offered by CourseMinded.com. If you enjoyed this post, please consider a donation to our cause. Author receives 25%. “Show Them That Your Online Course is Time and Cost Effective” This is an invaluable point in this content. Educators that intend sharing their online courses must ensure they deliver value to readers. Value addition practically starts with showing time and cost effectiveness. These marketing tips are on track and educators must make the most of the details! With so many options for online learning, educators will largely benefit from showing how their courses can save their students not only money, but time. Yeah, i will implement on these tips and want to thankyou.